The concept car that was simply known as the ‘Turbo’ was designed by Paul Bracq in the early 1970s. He was the Director of Design at BMW at the time. 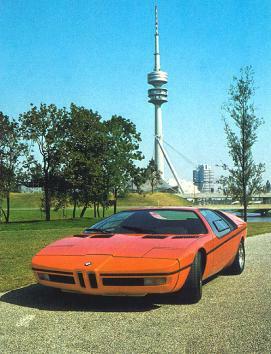 Even though no official credit was even given, it is clear that the M1 took many of its styling cues from Paul Bracq’s show car. 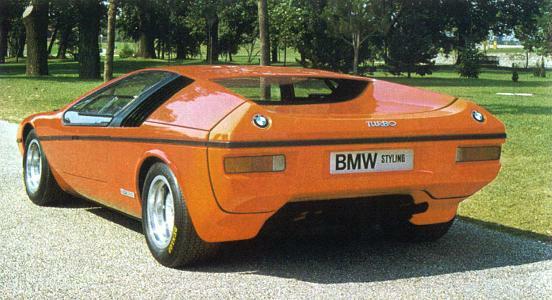 The spectacular Turbo generated a lot of excitement and in some ways may have paved a way for the M1 through the BMW boardrooms. The unveiling of the Turbo was timed to coincide with the (infamous) 1972 Olympics held in Munich. A turbo charger gave the relatively small 4 cylinder engine enough breath to produce 200hp. This was sufficient to travel at speeds up to 155mph. would alert the driver if he was getting to close. A lot of attention was given to crumple zones to increase the chance of surviving a crash. There were foam-filled front and rear bumpers which hid telescopic steel beams that would absorb the force of a collision. The car also featured strong bars in its doors, protecting the occupants from the negative effects of a side-impact.